I have a deep and abiding love for udon. 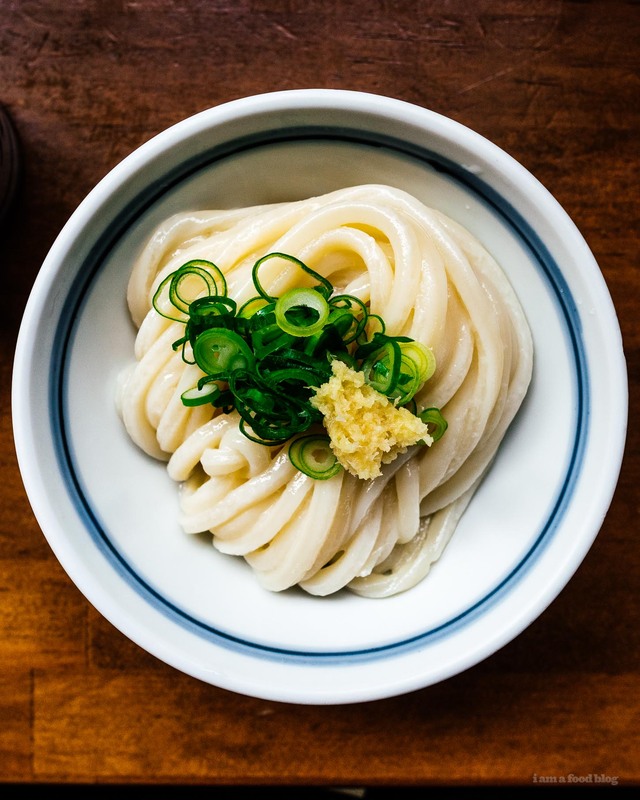 Soba and ramen get all the love, but the humble, unassuming udon noodle is my favorite. Thick and chewy in the best way, super slurpable udon noodles don’t get enough love. They’re just the right amount of firm, with a smooth supple bite. Perfect hot, cold, or anywhere in between. 1. Inaniwa Udon from northwest Akita: thin, chewy, and smooth. Inaniwa udon take up to four days to make and used to only be eaten by the Imperial family. 2. Sanuki Udon from Kagawa, Shikoku, the smallest island in Japan: square cut, firm, and supple. 3. Kishimen Udon from Nagoya, the fourth largest city in Japan: thin and flat. 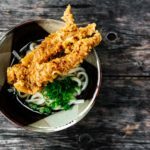 There are many more udon types, but perhaps the most well known both in Japan and abroad, thanks to food tourism, is sanuki. 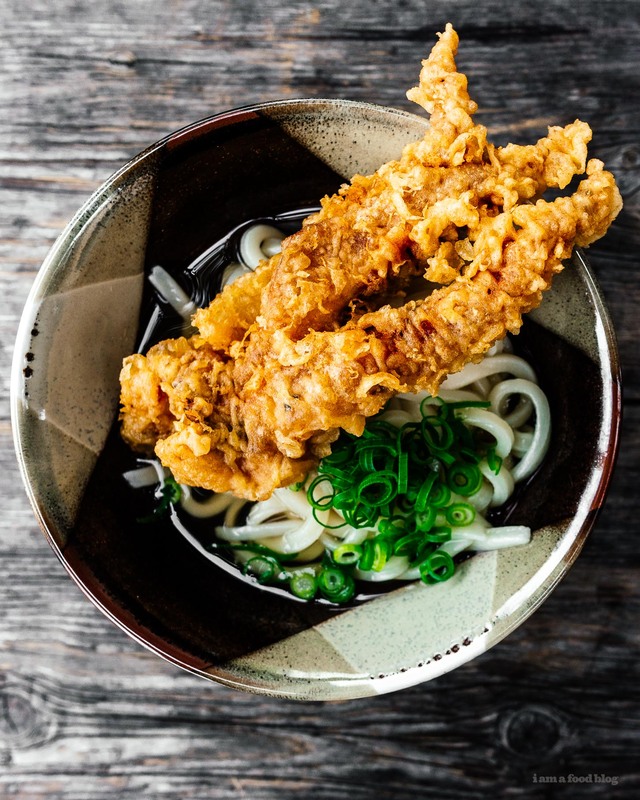 Kagawa is said to have the highest udon consumption rate in Japan – they even refer to themselves as the udon prefecture. 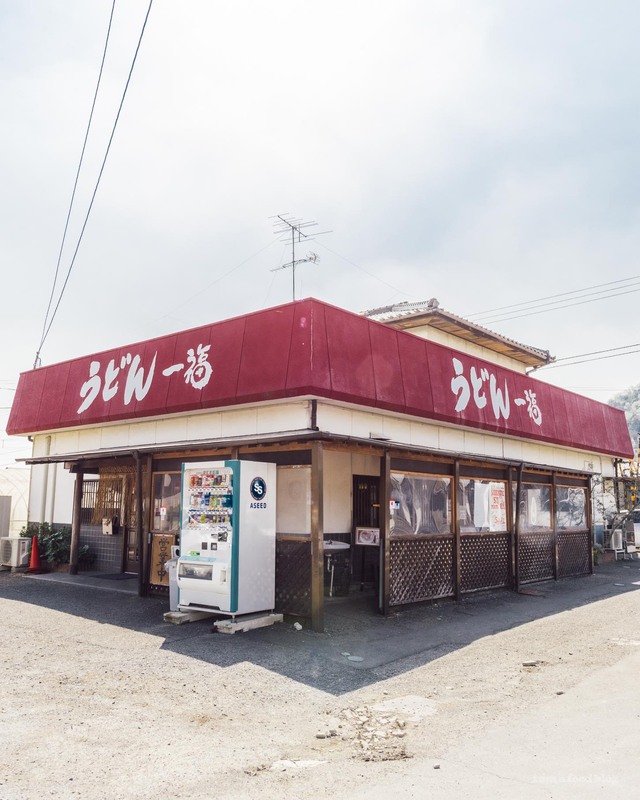 As a noodle lover, it just didn’t feel right that Mike and I have never been to Kagawa. So, with empty bellies and open hearts, we boarded the Shinkansen towards the land of broth and udon. 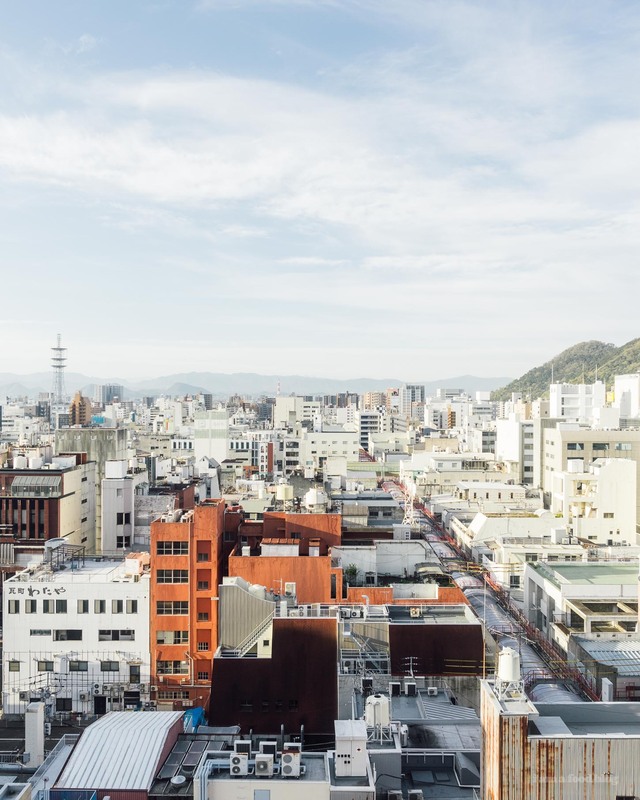 We arrived in Takamatsu, the capital city on the Island of Shikoku. It’s pretty small as cities go and we chose it more as a home base, rather than a city that we really wanted to explore. Nonetheless, that first night we managed to have a disappointing mediocre bowl of udon as well as their city specialty: chicken baked on the bone. Neither were anything to write home about. I was still a bit jet lagged (okay, majorly jet lagged) so we called it an early night so we could go udon trekking bright and early the next day. 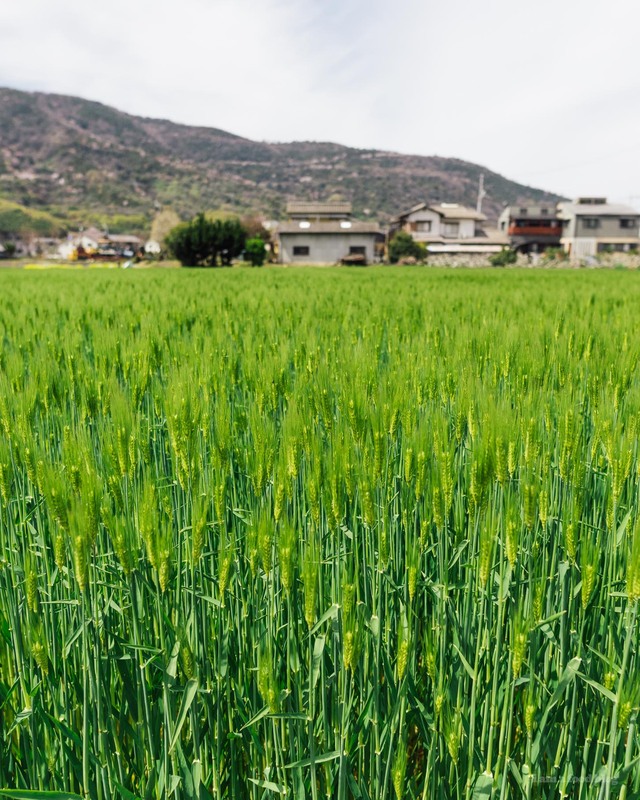 We started off our udon itinerary by hopping on a local train heading east through fields and fields of vibrant green wheat. 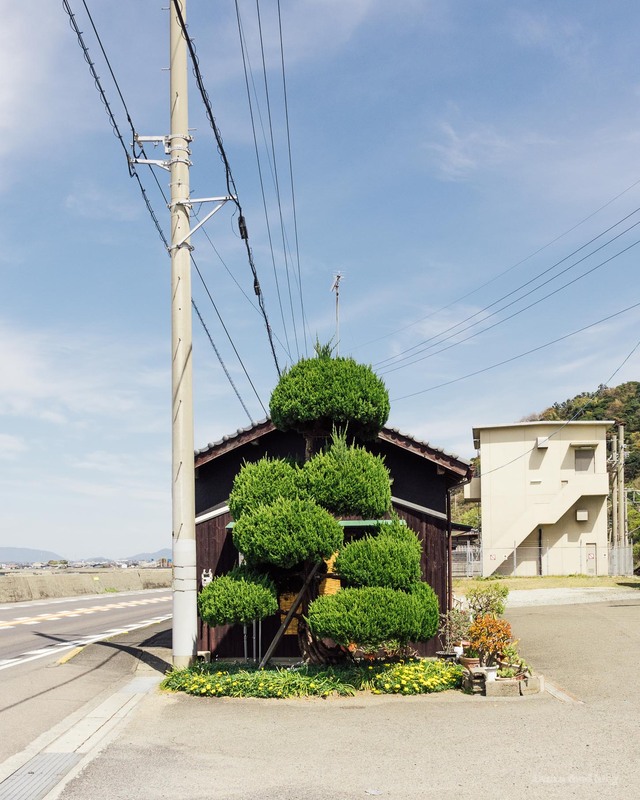 Our destination was the tiny town of Kamogawa. We got off on the platform, crossed a river, and walked through quiet residential streets until we saw an incongruous parking lot full of cars. The cars were there for the same reason we were: udon. Well, at least their drivers were. There was a line made up of what looked to be udon pilgrims and locals, quietly waiting to get inside for their bowl of udon. There’s barely a menu and all you need to know is if you want your udon hot or cold and how many bundles of udon you’re hungry for. After you let the chef know, he hands you a bowl of udon. 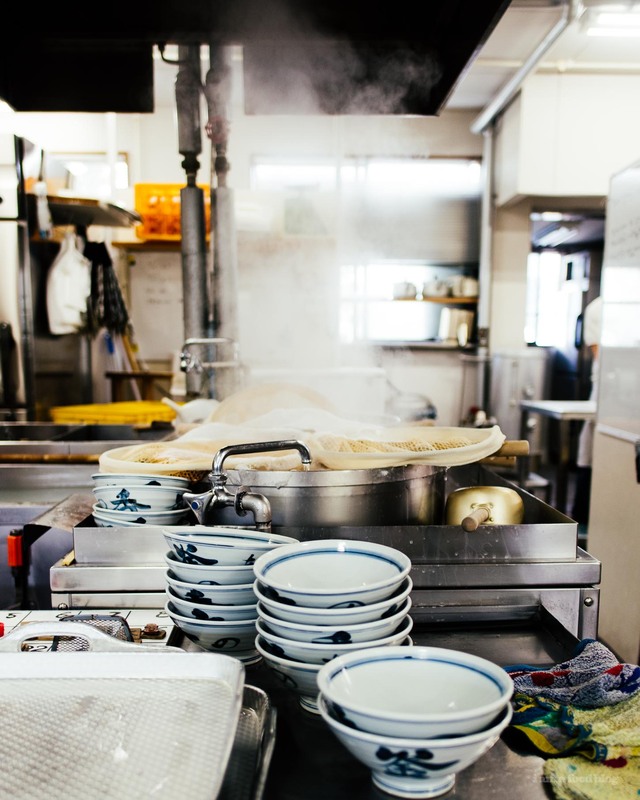 Then you get your toppings, pay, and head to the giant pot of dashi that’s on a soft simmer. Fill your bowl and top it off with some green onions and then head outside to eat on a bench. Part of the fun was slurping outside on a sunny day with everyone else doing the same thing. There were construction workers, families, and us. The noodles were just the right amount of firm and chewy – mochi mochi as the Japanese like to say. We got a bowl of both cold and hot so we could compare. The cold udon was a touch more firm and the warm udon soaked in a bit more of the dashi flavor and was just the tiniest bit more supple. A pure and simple bowl. 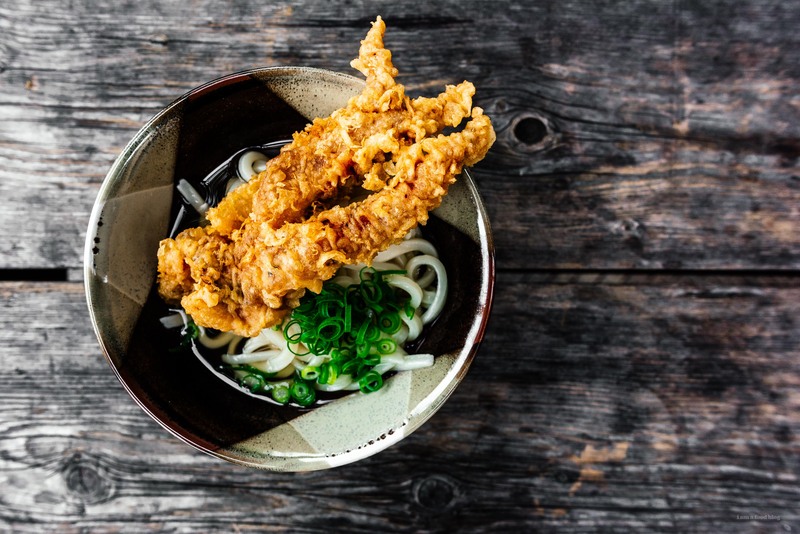 Seriously, nothing beats the combination of udon and tempura. 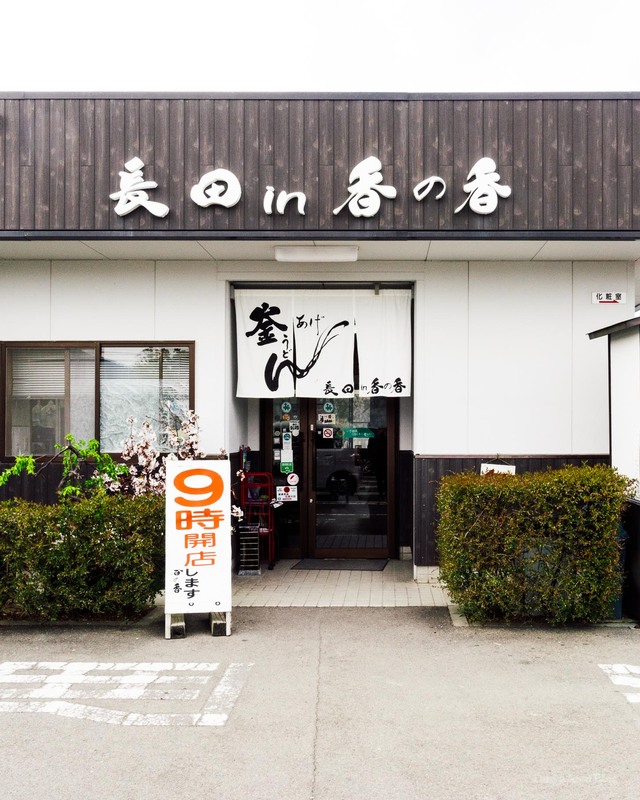 If you love udon, you’ll appreciate the udon here, like much the rest of Japan. Gamou is one of the highest rated udons in Japan. 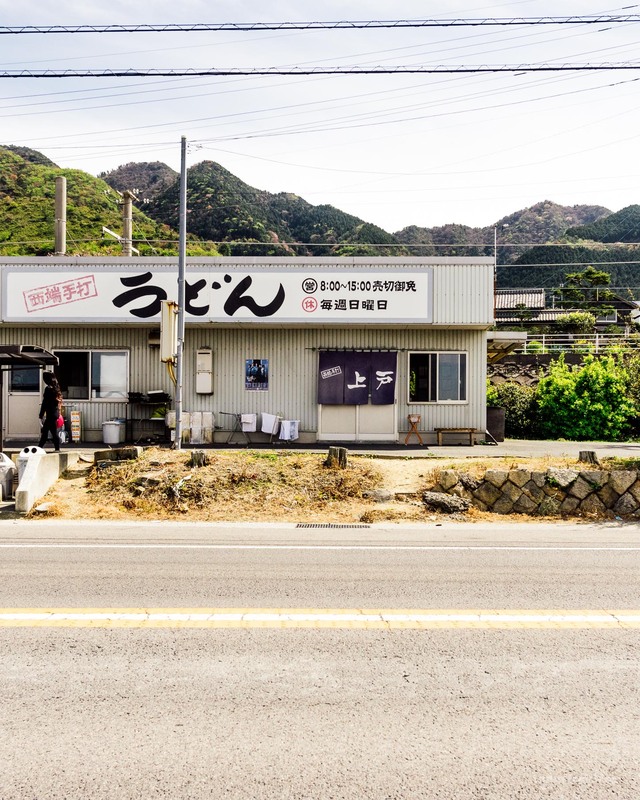 After our bowl at Gamou, we headed back on the train towards Minoura Station, a tiny station that consists of a platform by the Seto Inland Sea. 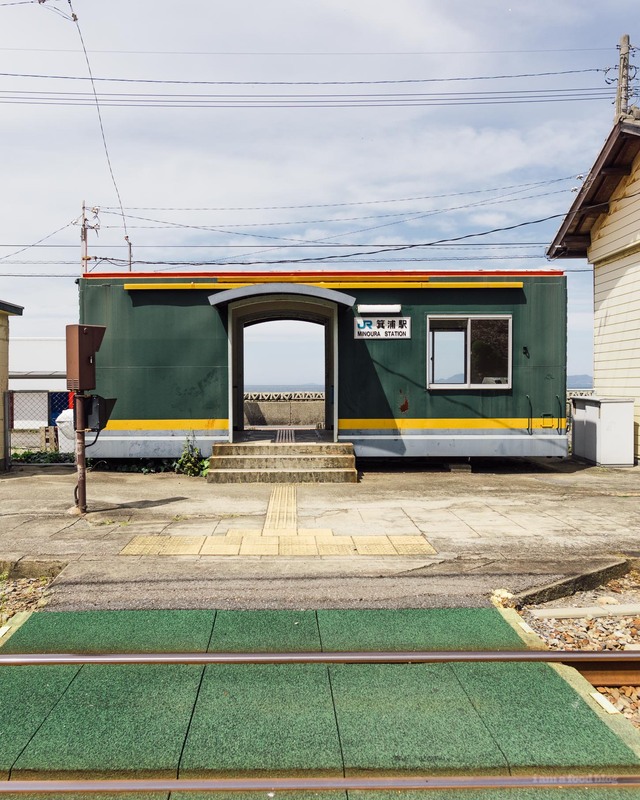 We got off the train – we were the only ones who did – and headed across the train tracks towards a tiny little shop by the sea. 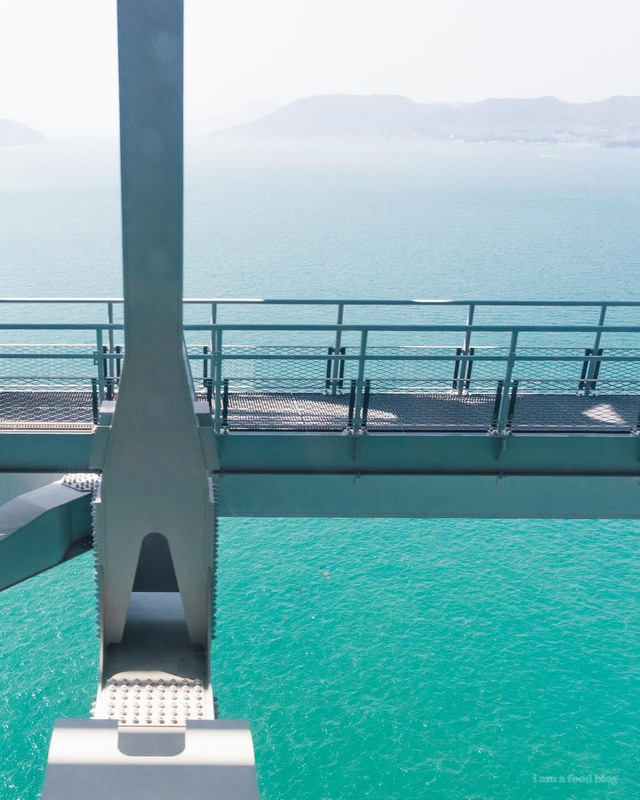 Looking towards the Seto inland sea you can see the concrete blocks breaking the tide. Looking back towards the tracks, there’s a sun worn blue noren fluttering in the wind to let you know you’re at the right place: a for-the-love-of-udon shop opened by a husband-wife team that runs Japan’s number 6 udon shop according to the ever popular Tabelog – Japan’s definitive restaurant rating catalog. 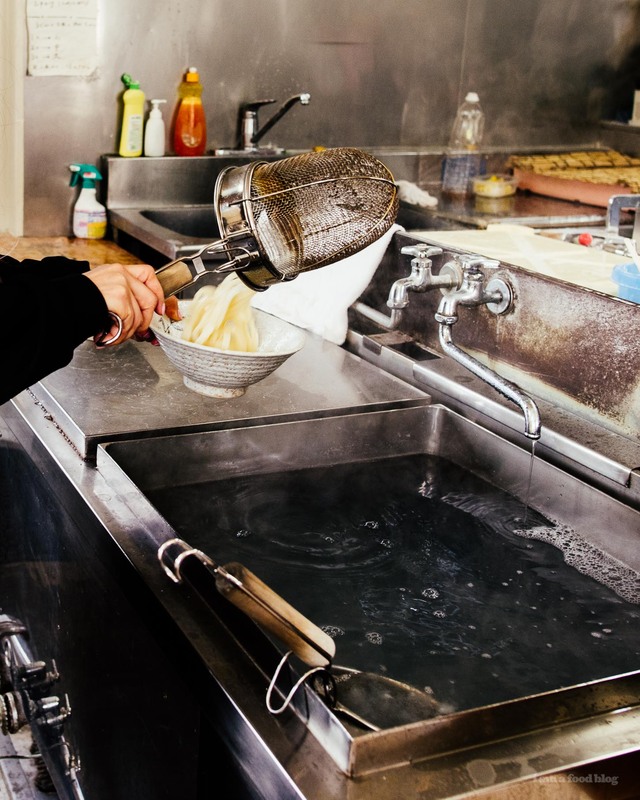 Order your noodles from the friendly proprietress – she’ll hand you a bowl and gesture you towards a vat of boiling water where you heat them up briefly yourself. Top it off with dashi, green onions, and little bits of tempura crunchies. Choose from the small selection of tempura, pay, and find a seat. We sat down at a counter seat next giant window facing the train tracks. There was a small grove of Sakura trees in full bloom. The sun was streaming through the blossoms and a gentle breeze blew soft pink petals through the air. 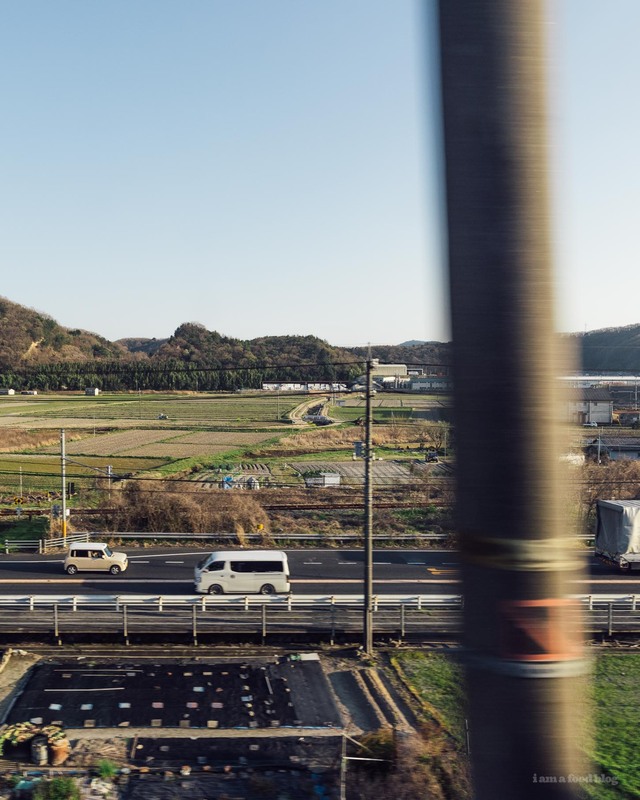 It was like something out of an anime: the warm spring sun, a train rumbling by, the sound of Japanese talk radio murmuring in the background, and the laughter of the husband and wife chatting with each other. I was deeply deeply content, me by Mike’s side, the both us of lost in our bowls, slurping in silence. The noodles were thick and slippery and chewy in the best way possible and the experience just couldn’t be beat. 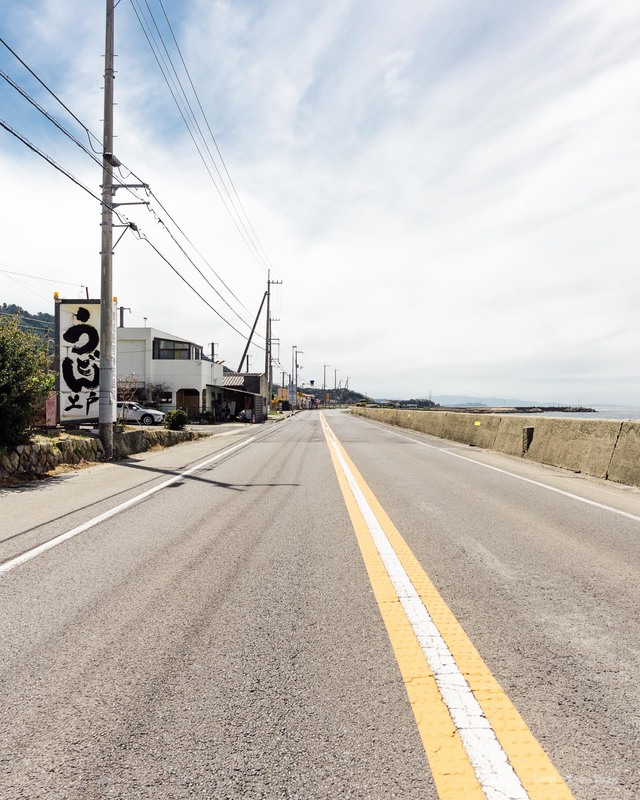 Nagata in Kanoka is rated the second highest udon in Japan. 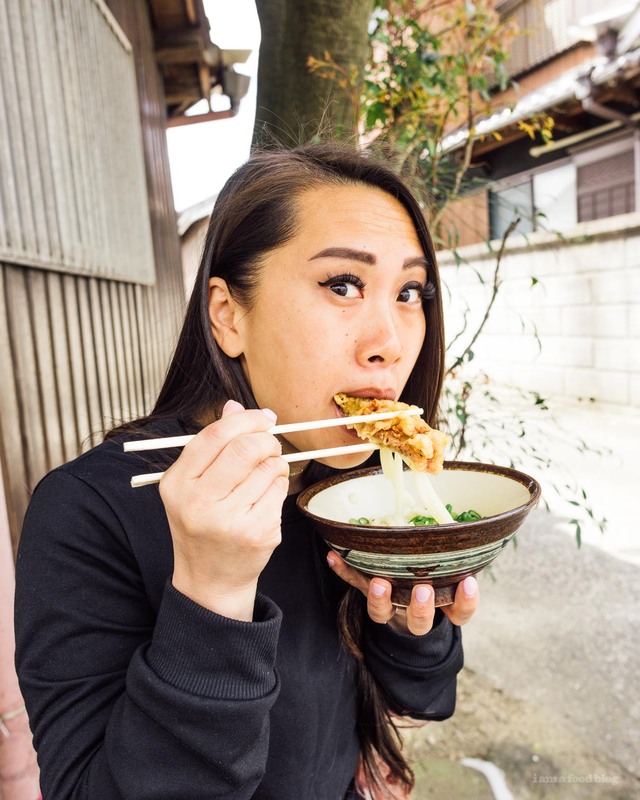 People travel from far and wide for a taste of their udon. As we got off at the train station, we even noticed another udon fanatic walking towards the restaurant at the same pace we were. When you get there, you’ll see a giant parking lot filled with cars. 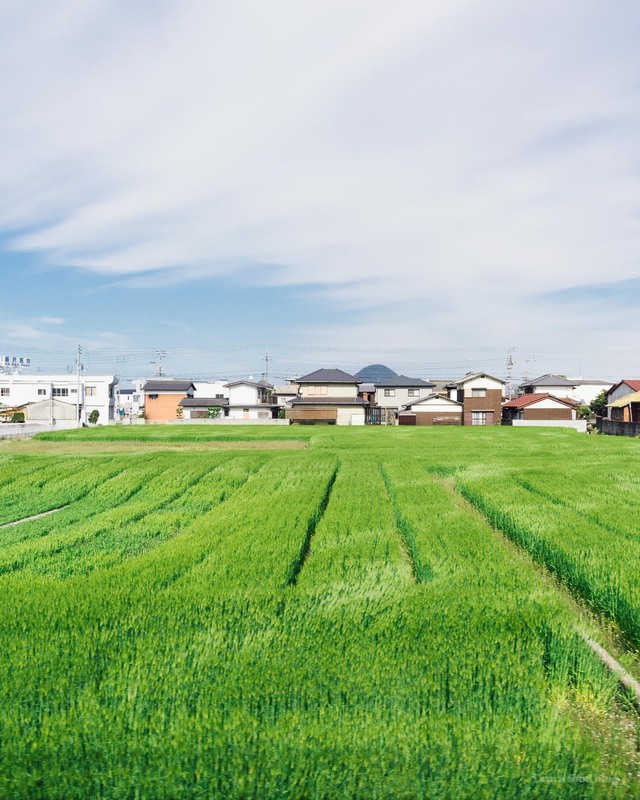 Cars are definitely a thing in the Japanese countryside – it’s a lot easier to go on an udon tour if you have a car. And for some reason, all the tourists going around eating udon are local Japanese people. Nagata in Kanoka had the feel of serious udon place with a bunch of udon heads, plus some local grandmas and grandpas thrown in. Anyway, much the same as the other udon places, all you can do here is order hot or cold. There aren’t even any toppings to be had. This place is ALL about the udon, nothing else. And the thing is, it didn’t disappoint. We ordered a hot and a cold, of course. The hot came in a bowl its own cooking liquid and a huge jug of hot dashi. You pour the hot dashi into a cup, add some green onions and ginger, then grab some noodles from your bowl and dip it into the soup. The first bite of udon was SO GOOD. Very chewy and slippery but not too soft. The hot ended up being just a touch more soft/supple compared to the cold, as per usual. The cold was beautifully firm yet chewy. It’s the kind of udon you want to eat over and over again. The first bite of the hot udon is very impressive, but the cold is what you’ll go back to time and time again. 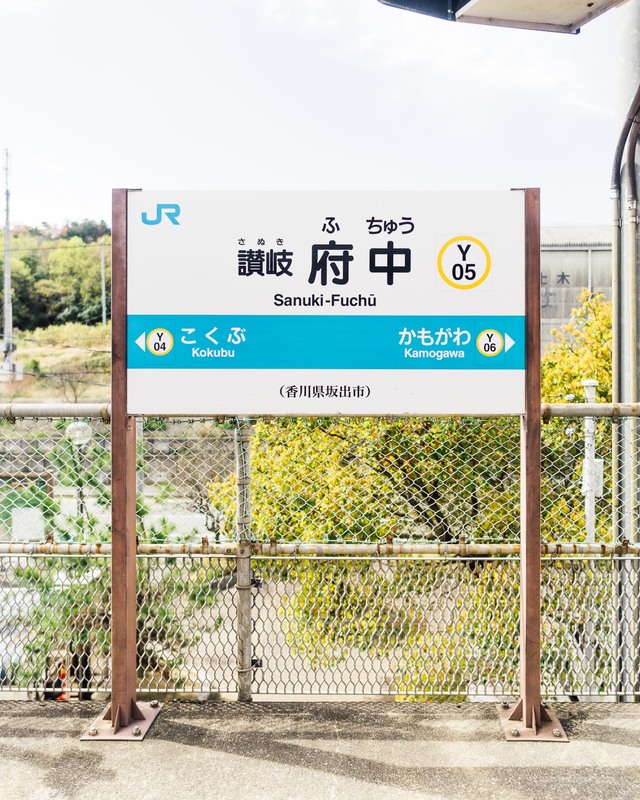 We visited Ippuku the next day, fresh from a good night’s sleep. 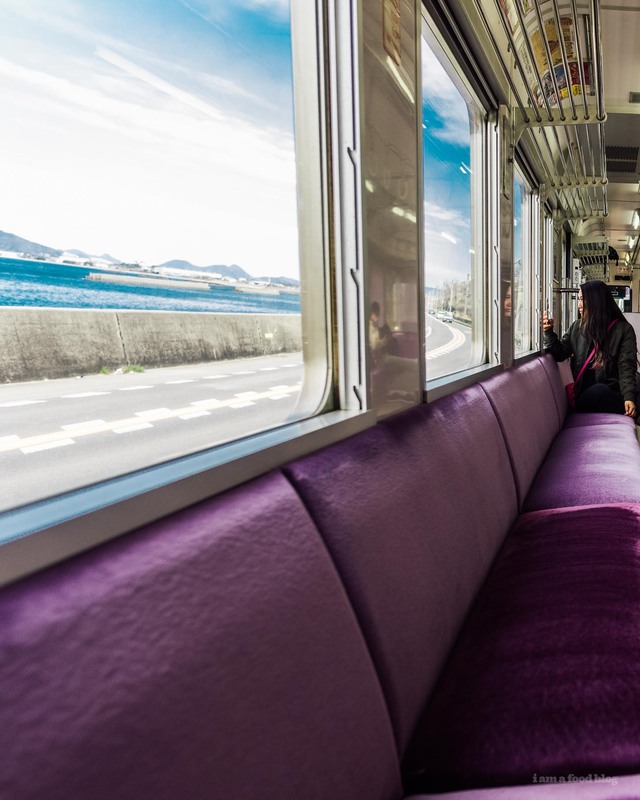 It’s only a couple of stations away from Takamatsu, the capital city of Kagawa, so it’s a very easy udon destination, especially compared to some of the other udon shops that we visited. After a short walk from the station, we came across a cute little neighborhood udon shop full of families, young couples, and groups of friends. 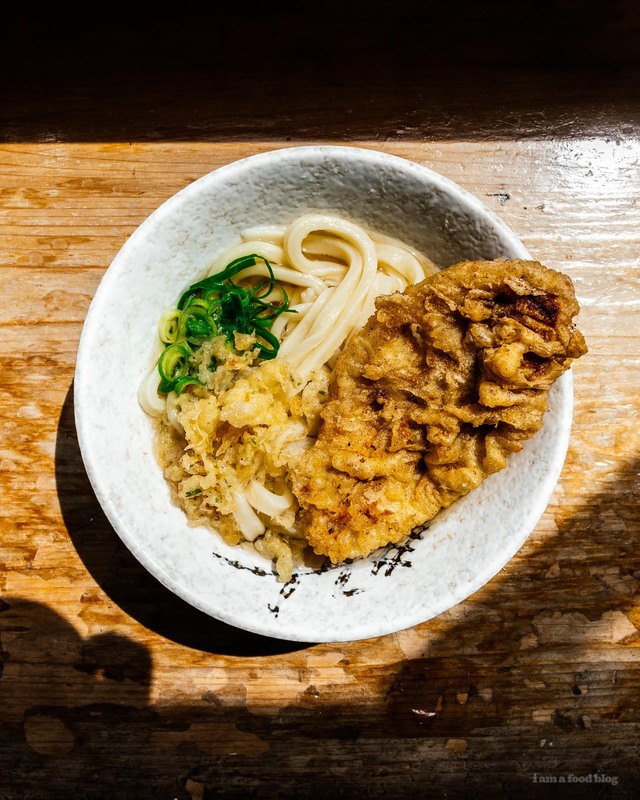 Ippuku is a casual sort of udon place, the kind where you grab a tray, then head down the cafeteria style line. 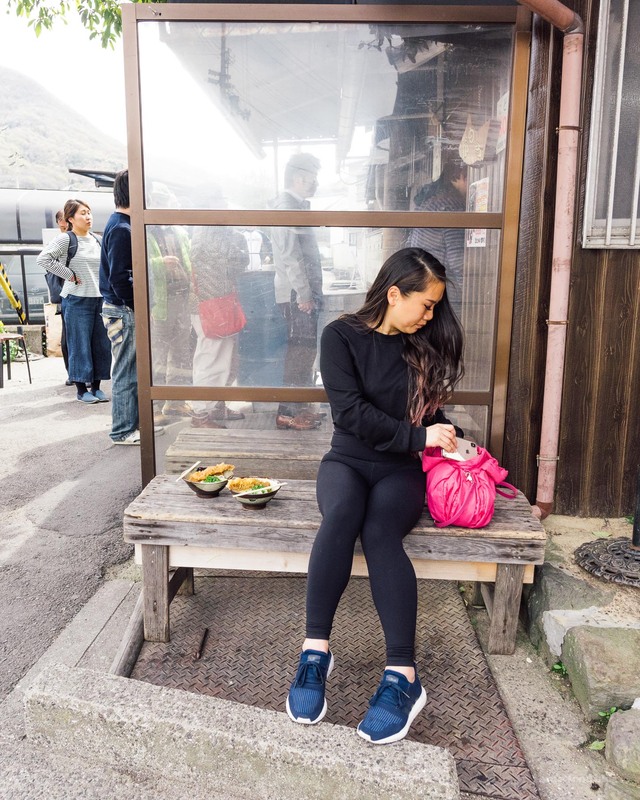 First you pass by a selection of onigiri, then you let the udon chef know which noodles you want, then you pick up your toppings, pay, find a seat, and slurp away. Ippuku has the most extensive menu of all the udon shops we went to. They have the classics of course, but they also have kama tama, a sort of carbonara type situation with a raw egg; curry udon featuring that classic thick Japanese curry sauce; and niku udon, udon with dashi and thinly sliced beef, kind of like a gyudon beef rice bowl, but on noodles. I was going to go for kama tama, but ended up getting niku udon because that’s what Mike always gets and I always covet his bowl. It was a good move. The beef was tender and sweet, the dashi perfectly seasoned and the noodles…oh my goodness, the noodles were intensely good. Even though they were slightly thinner than some of the other udons we visiting, they still had heft and chew. So slurpable and completely satisfying. It was probably the best udon shop to end on. Fun and friendly, with a room full of laughing udon eating locals. My udon heart was so full. Note: it’s actually unclear which three udons are the top three famous udon in Japan, because there’s some discussion on what the 3rd udon is. 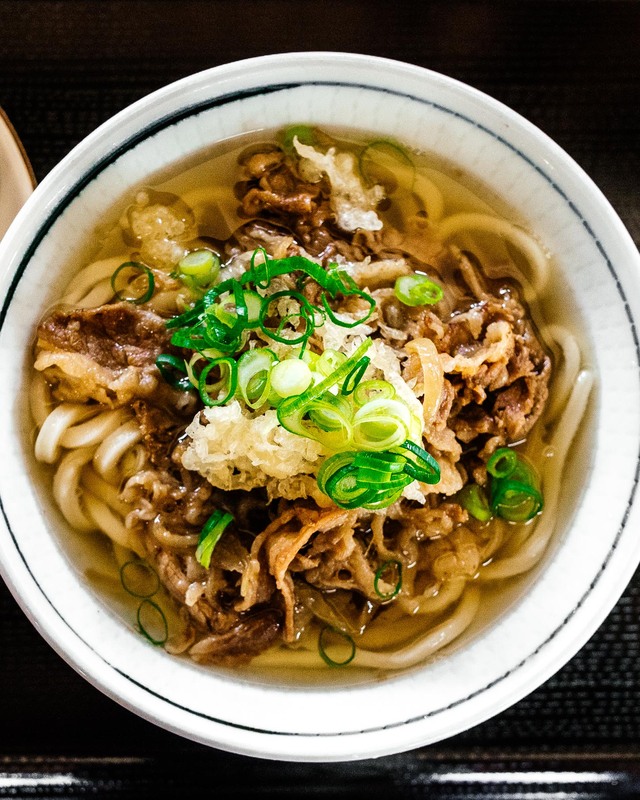 Some say it’s Kishimen, some say it’s Mizusawa, some say Himi udon is the third. I guess we’ll never know, but in my heart, sanuki is number one. I thoroughly enjoyed this post. 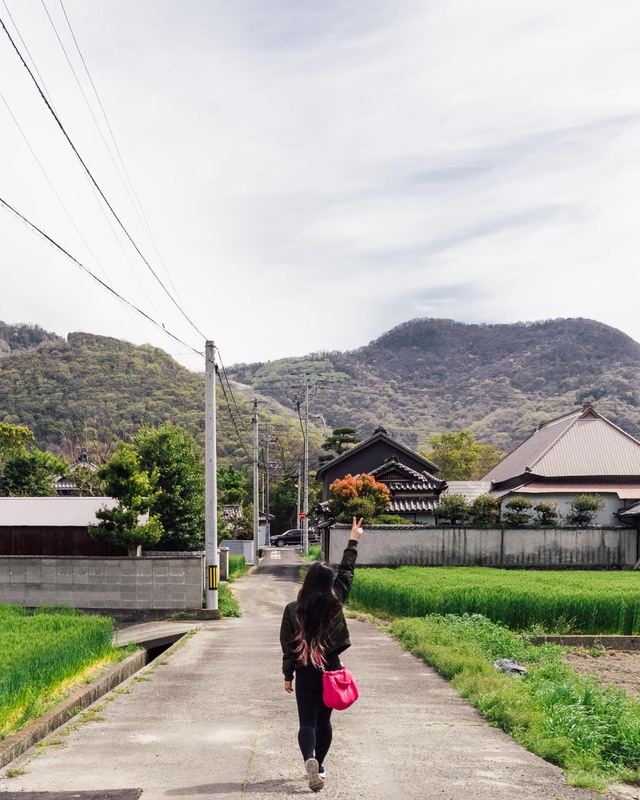 Beautiful photos of the udon and surrounding scenery as well as the detailed descriptions of each place that make me feel like if I’m right there.